Toyota says the Verso-S will be Europe's shortest minivan. Toyota will re-enter the small minivan segment in Europe with the Verso-S. The model will debut at the Paris auto show on September 30 and will go on sale early next year. The Verso-S will be the shortest small minivan on sale in Europe, Toyota said, with a length of less than 4000mm. It will "showcase efficiency in space management," the automaker said. Toyota stopped selling its Yaris Verso small minivan in Europe in 2006, leaving the Japanese company with a gap in a fast expanding segment. In 1999, when the Yaris Verso was introduced, the segment totalled 80,000 annual sales in Europe. Last year, the segment had sales of nearly 407,000, according to JATO Dynamics. The Verso-S will be based on the new generation of the Rectis, a Yaris-based model sold in Japan. Europe's small minivan segment is led by the Opel/Vauxhall Meriva, with 83,746 units sold last year, ahead the Citroen C3 Picasso, with 75,723 units and the Renault Modus/Grand Modus at 71,054 units, according to JATO. Yaris Verso sales peaked to 34,449 units in 2000. 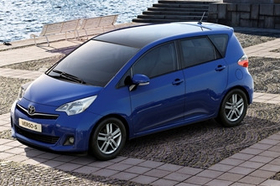 Toyota sold almost 158,000 units of the Yaris Verso in Europe.